Merchandising Methods Redefined. What impact will RFID, Smart Dressing Rooms and Smarter Merchandising software portent for Retailer Success? The stampede for must haves has begun, from toys to cosmetics to a new hat and gloves (for those north of the Mason Dixon line). The season is upon us. 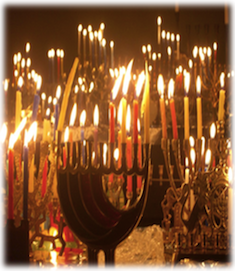 Chanukah and Christmas will fall very close together this year, increasing that holiday crunch in those last shopping moments. As I walked through the stores with mountains of holiday gifts and cool stocking stuffers, my sister warned me to complete my holiday shopping work early as my preferred item would no longer be available in December. Really? Money to spend, but not the desired item when I want it? Buy it now? Why should I give stale chocolate 42 days from now? These are seasonal items. When they’re gone—they’re gone. Or so it goes. Yes, I have heard that fashion and seasonal sectors don’t care about inventory. Really? And they don’t care about replenishment. Really? The theory goes that they crave selling it off. Tell that to the parent of those kids who must have that trending toy. Next stop on our shopping day was the outlet mall, where I saw the aftermath of the ‘selling it off’ theory. Here, in the outlet mall, is where mountains of so-called fashion items that nobody wanted at full, then marked down, and then even at promotional prices reside. Sell it off. Ah, if only they could! Have I debunked that myth yet? Please read on…. So What’s RFID Got To Do with This? As the Leon Russell song goes—the right place, the wrong time. Or the Cole Porter song—the wrong time ... the wrong face. Porter’s “It’s Alright with Me” theme may suit some, but not many shoppers. No. We are not willing to substitute. And that goes for stock items as well as seasonal and fashion too. The fit is the fit. If you don’t have my fit in jeans, I will move on. Fashion and lux? Ask the ‘handbag envy’ providers about that. The need to locate inventory and move it to the point of sale is critical. Your customer wants navy, not royal. And in our research, we interviewed and surveyed over 130 retailers. Not all were using RFID, of course. But those who were had important results to talk about. Said one European retailer, “Sales uplift is significant, and the core driver.” Many were quite specific about the impact of RFID on sales. “There aren’t any product categories where there are no improvements.” Every category. “The business case for expanding our RFID implementation to more stores and departments has been driven almost entirely by one key objective: identifying and correcting inaccurate inventory in the system. This is especially critical when the system believes there is stock in the store, but in fact none is there… sales opportunities are missed. We have measured sales improvements in every category we have used RFID. The best improvements have been where we have size and style complexity, such as footwear,” an RFID Program Lead for a Major Multinational Retailer told us. Every category. 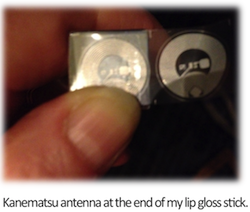 One of the holy grails retailers seek is the ability to tag cosmetics. Part of the challenge is the antenna, of course. Creating a long enough antenna in a very small space—also often near or on metal or liquid—is a tough challenge. Packing an antenna in a very small space requires extremely advanced and high quality processes, one that only a few in the world possess. (I won’t go into the details here. I will save that for another article.) I recently saw an antenna that might work here. So, this may be the moment… when the lipstick and nail polish, or eye shadow and liner, or the perfume and matching body cream can all be easily located and sold, rather than having customers leave because they cannot make a set. Brand Protection from Factory for Life! Another innovation is the woven RFID tag. These tags can be attached during the manufacturing of garments, handbags, etc. and are kept throughout the life of the item. They are ‘laundry proof,’ I hear. Thus, they can be used for commercial applications such as uniforms, or for industrial applications—not just for consumers. Though a bit pricier, they have the potential to replace a plethora of additional tags that accompany a product’s journey. My running jacket, for example, had seven product tags. These do not include the retailer’s price tag or the EAS tag. Total 9 tags! We probably will attempt to figure out the ROI on this, but don’t let us hold you up. Brand/apparel and sportswear companies are already running the numbers for themselves. It’s not just inventory management and brand protection, but the overall cost of labels and tags that could be impacted by this innovation. Here is an area applicable to fashionista brands. The design to sale process is stressful and often archaic. Chico’s was notable for re-engineering and cutting design cycle time processes with RFID.3 Fast and high fashion really care about time. How to manage the flow of the Prada, Robert Clergerie, Gucci, etc. from manufacturing and retailer into the gilded luxury liquidators? RFID. These are still big ticket items, even in the aftermarket. But there, they are really gone when they are gone. (I want those size 6 loafers—sorry only one in stock. Gone!) 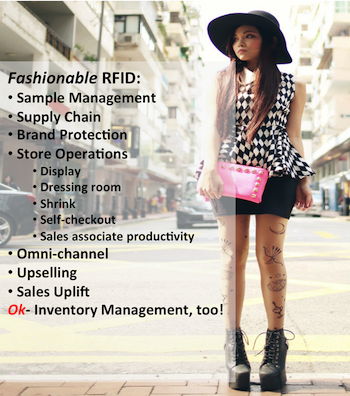 Used by Gilt Group and others to manage the flow, locate (and hold) inventory, and for brand protection, RFID can mean the difference between that six hundred dollar sale or none at all. The holiday is just one of the worst times to disappoint consumers. Where in the world is that item? Whether it’s a one-time buy, fashion or seasonal item, or a stock replenishment item, having just one to sell makes it critical. Where in the world is that item? And can we ship it, at low cost and on time, to the customer? Will this be click and collect? Same-day home delivery? Locating inventory is not just about inventory management, but determining the right fulfillment method that satisfies the customer and does not break the bank. Another critical area is total supply chain management. Here is the ‘tag-along’ ROI again. Brand, visibility, security, shrinkage, inventory management, and store operations all are benefited, reports say. Specialty, brand, and private-label retailers look at the total process. Fast fashion doesn’t get any faster than with firms like Gerry Weber, Zara and even Façonnable (those are a bit more classic and longer lasting products). They look at RFID as an enabler of multiple solutions beyond replenishment. For example, on the heels of their successful shoe RFID project, Bloomingdales5 just announced their dressing room pilot.6 Prada did this. But that was ten years ago and technology to support this exciting customer experience is now ubiquitous, which it was not back then. Having a mobile/reader network and large categories of tagged items (ok even barcoding can work here), can ensure that the consumer is not stranded, unsure of where the items are located. No doubt benefits like cycle counting and replenishment are powerful benefits for the stock items. But in fashion, one sale can be big bucks. Why miss it because of missing inventory? Retail Business Consulting, RFID Sherpas LLC. 6 We’ll provide more on that in an upcoming article.